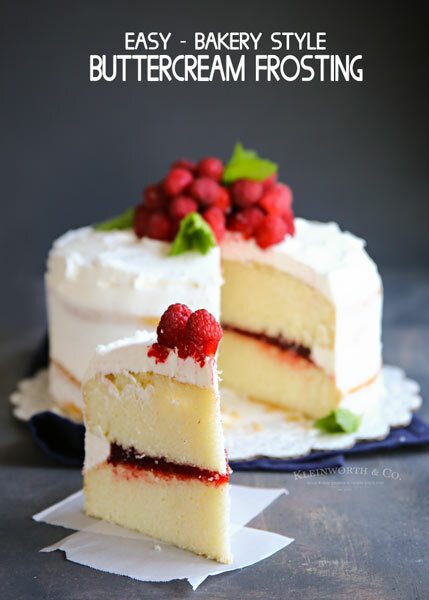 Raspberry Cream Poke Cake – Simple and easy dessert for every holiday or celebration! Hi friends! How are you? Are you excited for the cooler weather? It has me thinking about the holidays. I’m not sure what it is about the holidays but it always puts me in the baking mood. That being said, I still like quick & easy baked treats because I tend to get a little disinterested when things take too long. 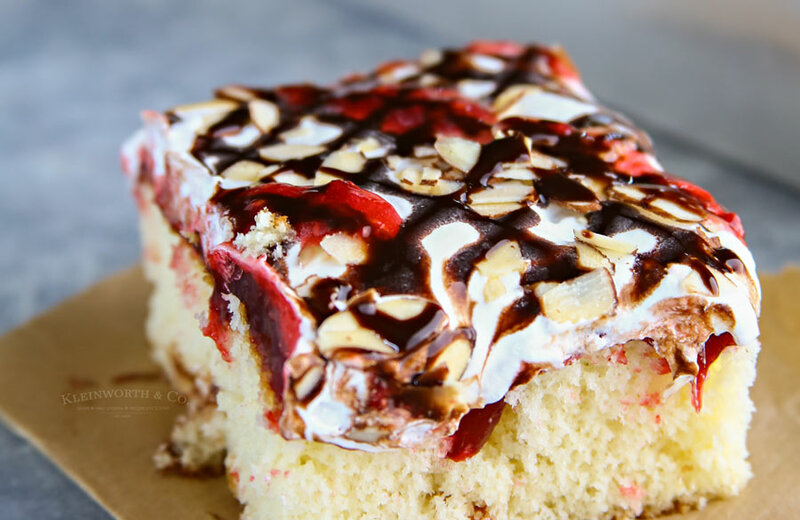 So recipes like this Raspberry Cream Poke Cake are always on the top of my list. 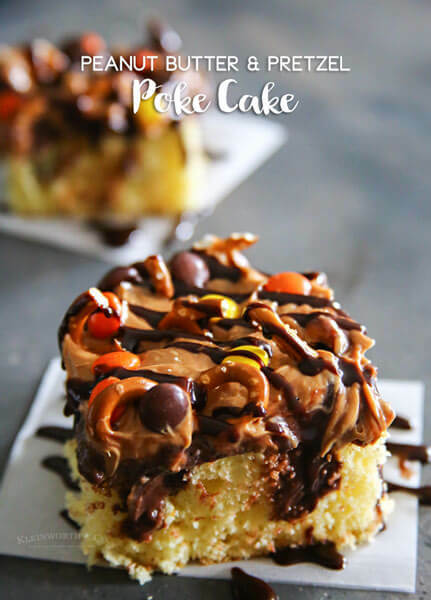 Up until a couple years ago, I had never made a poke cake before. But once I baked my first, I was hooked. All the gooey goodness poked through to the center of the cake is magnificent. It’s like having all the yumminess of a filled & layered cake, without all the work of baking a bunch of layers & decorating. That’s a win for me because I sure love cake. I mean, my mom used to decorate cakes semi-professionally when I was little. She worked in a bakery when I was really little & then transitioned into other work & did cakes for friends & family on the side. 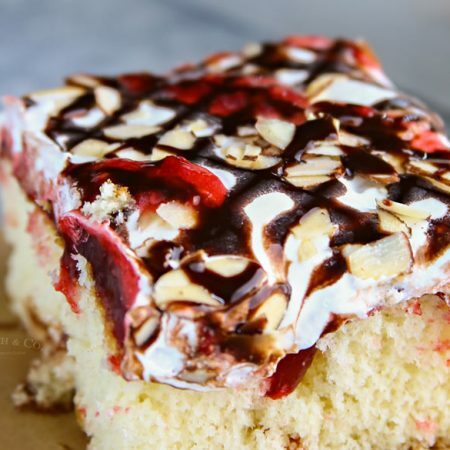 I grew up with delicious cakes being made in our house almost every weekend & it was pretty nice. I learned a thing or two about cakes, which was really cool. But I’m pretty sure with as fancy as mom’s cakes were, she would probably love the ease of poke cakes just as much as I do. 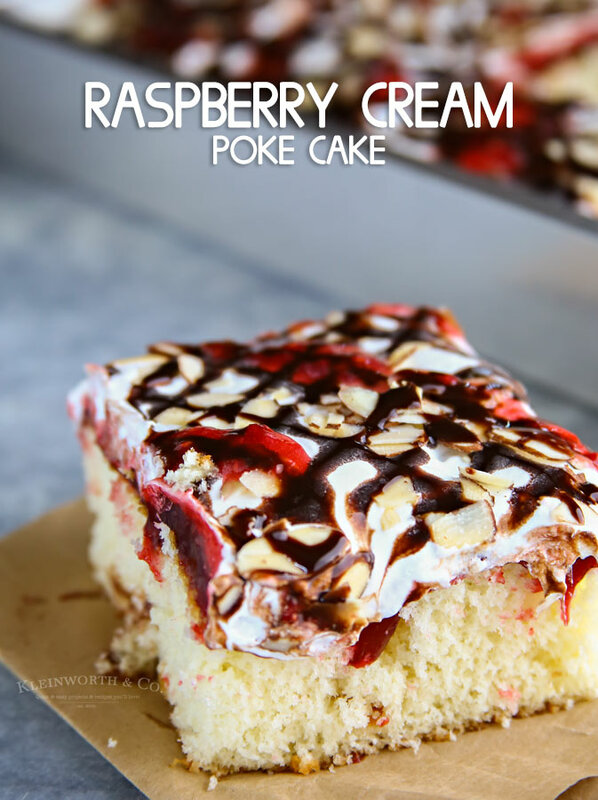 Raspberry Cream Poke Cake- So good! Prepare cake according to package directions for a 9 x 13 pan. Pour 1-1/2 cups raspberry filling all over the cake- pushing it into the holes. Drizzle on chocolate sauce, then remaining raspberry filling. Look at all that raspberry goodness. You can decorate the top any way you like. I thought a criss-cross pattern was a good choice. 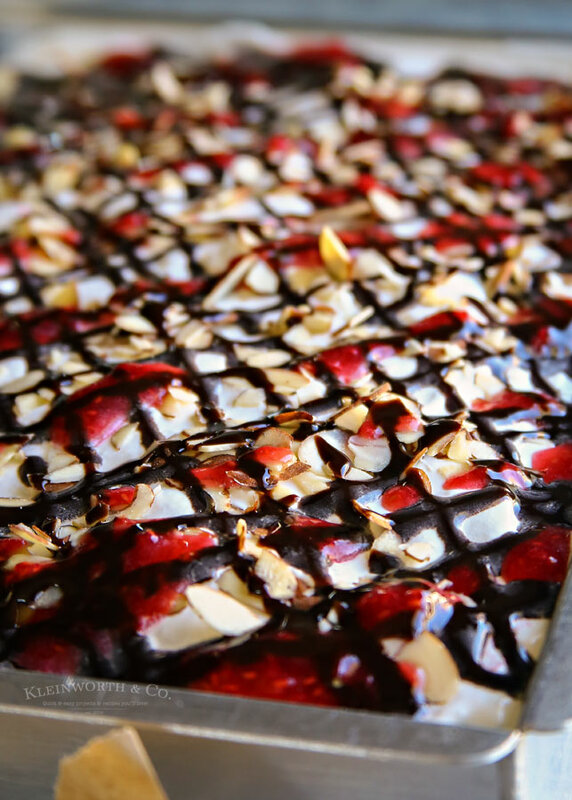 I think it looks pretty with the slivered almonds. 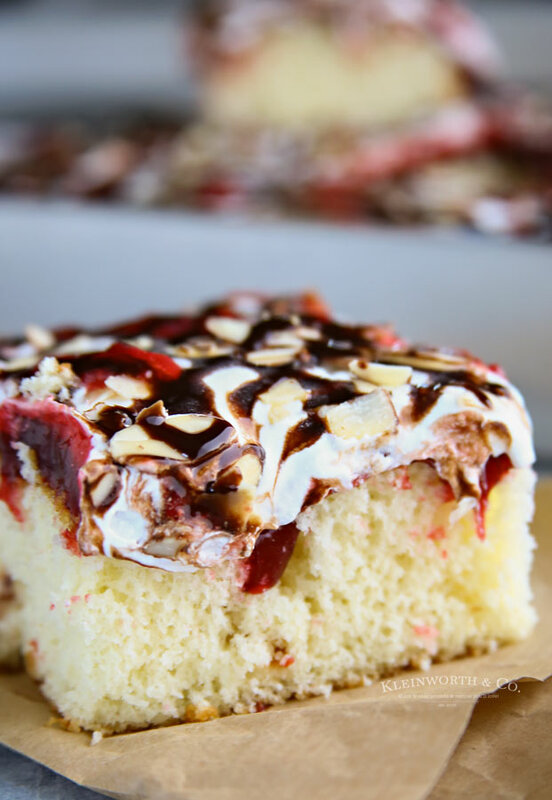 You could also use sprinkles, mini chocolate chips, candies or any other favorite topping you wish. That’s the best part of these super easy cakes. It’s all about whatever you can dream up to drizzle on & sprinkle around. So good! I know I’ll be serving this one through the holidays & into Valentine’s Day as well. I hope you enjoy this as much as we do! Looking for more of our favorite recipes?